You dudes may remember that not even an entire month ago I got my act together and finally put my horse print up for sale on etsy. Well, it was such a darn good time I've gone and done it again. 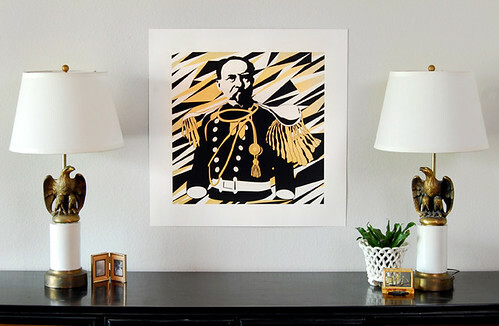 Lasers in General is my newest piece, printed in (ahem) METALLIC GOLD and black, he's 26" of pure shiny federalist awesomeness. Limited edition prints are for sale on etsy HERE. Why do they cost less than the horsey? Because it's smaller and was much easier and less expensive to print. Bada bing. Thank you, Erin, for your lovely photography and styling skillz. Don't you guys j'adore the eagle lamps with the general print? Can I get a whatwhat?